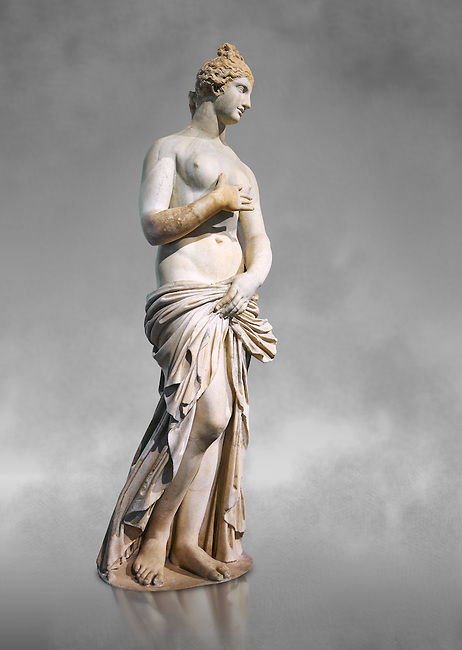 Roman Statue of Venus (Aphrodite), a 2nd - 3rd century AD marble statue from Italy. This Roman statue of Aphrodite is the result of a fit between the bottom of an ancient body, a torso of the XVI century and an ancient face and top of head. The statue follows the style of a modest Aphrodite, known by other Roman replicas are copies of 3rd century BC Hellanistic Greek statues now lost. Borghese collection, Inv No. MR. 279 (Usual No Ma 369), Louvre Museum, Paris.